Now, just to shut Andrea up (just teasing, Andrea), I'll attempt to write about camp, which in case you didn't know, was 9-14 July. Camp was cool. What else can I say? 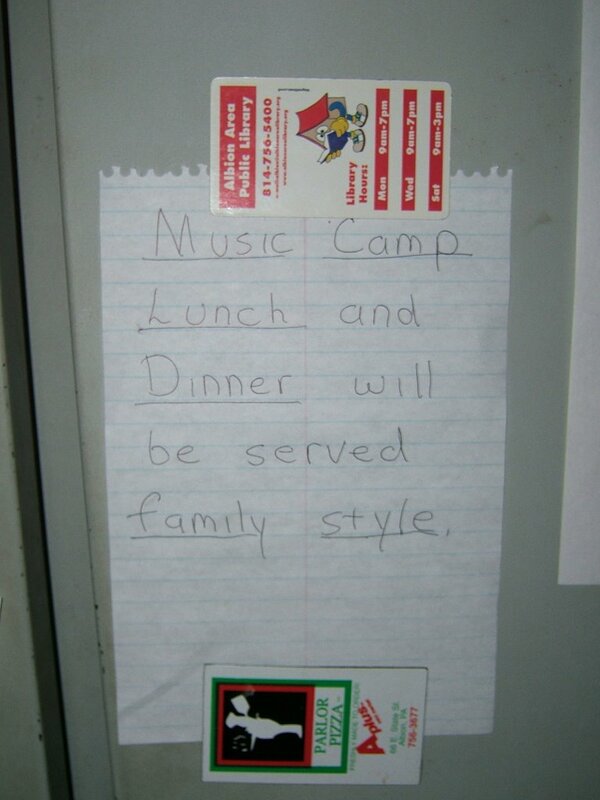 I mean, it's music camp! It's only the greatest place on earth! And it was even better when the announcement at left was read to us Sunday evening. No more buffet! Well, at least except for breakfast, but that's too early in the morning for anyone to care. 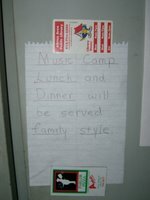 But this is what happens when the new resident director of the camp is a former music camper. He cares about his people. So now that I don't have a buffet to rant about this year, I'll have to come up with something else. Hmmm...this is hard! Our musical this year had a lower tenor part than last year, but I think we got used to the high stuff when we shouldn't have. From my first year at camp in 2000, we've been singing songs arranged by Dennis and Nan Allen, and in 2004, when we did the "Christmas in July" theme, our part was somewhat higher than usual. Then in 2005, we sang an "X-treme" Bradley Knight arrangement...and that was awesome! But going back to an ordinary Allen arrangement was a bit disappointing. Although, actually, it was still wonderfully fun. My best friend from camp started the week by complaining to Jayne, the choir director, that there was nothing higher than an E in our part. But that was just not the case. Neither he nor I looked at the last song when we were skimming through the songbook, so we missed the few Fs and Gs that were there. And it was fun singing them at the very end! Band with Mr. Cramer was fun, too. Like usual, I played Taps on Wednesday evening. And ducking from his "deadly accurate" commemorative pencil tosses made up for not playing "Day by Day" from Godspell. Because my school put on that production the following weekend...and it was wonderful. They actually sang with harmony for the first time in, like, ever! But enough about the high school's eccentric theater department. The concert was good, and my solo (duet) went very well, especially after Jayne gave me some pointers for getting me "in the mood." On top of that, in order to relax myself, I thought of the 76-beat-per-minute strolling tempo as just a 38-beat-per-minute relaxing tempo subdivided. And we kept having trouble keeping it in tune all week, but the Lord must've worked through us, because it was perfect for the concert. Yay! That's about all I can think about right now; I'm getting a little tired writing about camp. Besides, I have to be at the high school band room in half and hour to talk to the kids about the next fundraising opportunity...because Mr. Music Booster President (a.k.a. "Dad") has to work late tonight. Your best friend being Alec? Best friend from camp, yes. jeez. post this right after i leave. i see how it is...i hit you once in the morning, so i hoped that helped?